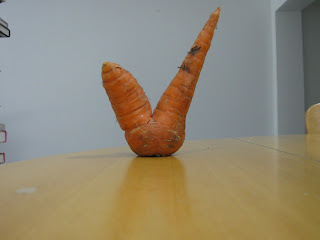 food for thought | a miami food blog: CSA Carrots - Check! Wow, no comment. No appropriate one anyways LOL. As for carrots and eating them, my friend makes them by whittling them down with a peeler and then just sauteing them in a pan with a little salt n pepper. No oil required! They taste awesome this way. Try it sometime. Mine were all knobby and hard to peel but I laid mine all out in the bottom of a roasting pan and put a nice fat organic chicken on top and stuffed it with preserved lemon, garlic and green olives and they tasted mighty fine! Very sweet!